1st Place: The team of Aaron Hochstedler and Bobby Nelson have taken control of the R & B Bass Circuit. They headed into the Diamond event with a slim lead that was less than a point. 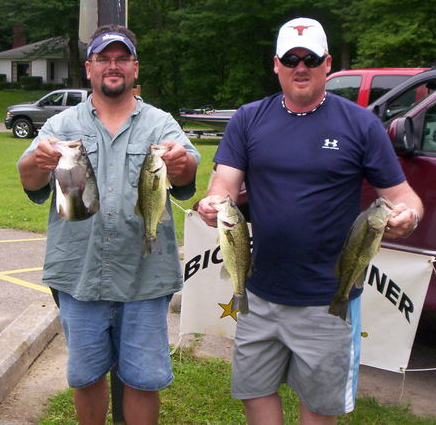 They left with a commanding 15 point lead in the standings after winning with the only limit that broke double digits: 10.63# ($460).They were anchored with a 4.13# largemouth which also won the Starboard Choice Marine Big Bass Award ($200). The winners took 2nd place at Winona and followed that up with a 4th place finish at Maxinkuckee. They are the only team to have earned a paycheck at all 3 events. They used a triple threat attack to claim this victory, alternating between Koppers' crankbaits, Mizmo tubes, and Gary Yamamoto Senkos. Congratulations on the success! But don't let down, because you have a big bullseye on your back now! 2nd Place: Newcomers Larry Thomas and Sean Cleland put on an impressive performance by loading the boat with a limit weighing 8.82# ($260). The team used a drop shot rig and culled 3 times. Perhaps with such success, we will see them re-appear for more of our money? 3rd Place: Kevin Rybicki and his substitute partner, Mickey Thomas, landed 12 keepers through the day and used a host of baits. They weighed 7.9# ($190). But they were ultimately anchored by a Canadian Mist tube by Xtreme Bass Tackle . Selfishly, I take some credit! As previously reported, I had done significant practice for this event. Unfortunately, a death in my family kept me from participating. When fishing with Kevin on Memorial Day I showed him this particular tube and told him this is the ticket for Diamond Lake. Unfortunately, up to that time, it had proven itself only with dinks. This day proved otherwise. Rybicki and Thomas also had success on Komodo Dragon stix and crankbaits. Contrary to previous tournaments, we were not met with ridiculous wind conditions at Diamond Lake. Participants were treated to spectacular weather. 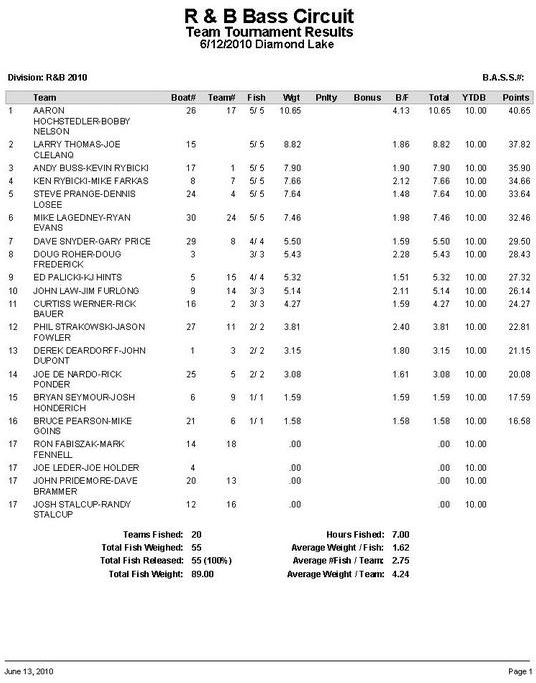 And, despite tough fishing predicted, 6 teams still managed a limit and only 3 teams left without weighing a keeper. Nelson (left) is holding the Starboard Choice Marine Big Bass in his right hand. Next time, someone must tell that fish how to pose. 4th Place: Still motivated by their success on Lake Maxinkuckee, rookie Mike Farkas and veteran Ken Rybicki proved again they are serious players in the R & B Bass Circuit by finishing with a limit weighing 7.66# ($110). The team fished patiently with wacky rigged worms and senkos to entice 8 keeper bites. 5th Place: Steve Prange and Dennis Losee continued their hot ways by winning the D's Lures Award with a limit weighing 7.64#. Fresh off their win on Lake Maxinkuckee, they again gained some serious ground in the standings. Like many teams above, they used a variety of baits to catch fish, but caught their keeper fish on wacky worms. 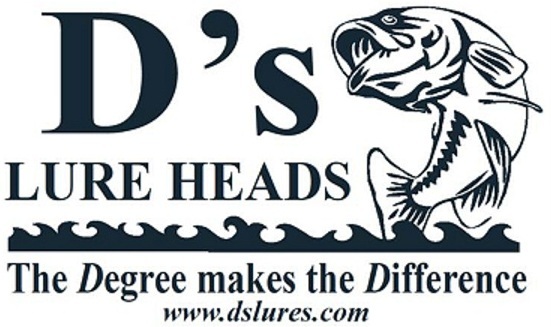 Thanks to the D's Lures sponsorship, 1 out of every 4 teams receives an award. Thank you D's Lures!